Industry representatives met Oct. 31 with Federal Motor Carrier Safety Administration (FMCSA) Administrator Raymond P. Martinez, at podium. ARTBA’s Nick Goldstein in front row third to right of Martinez. 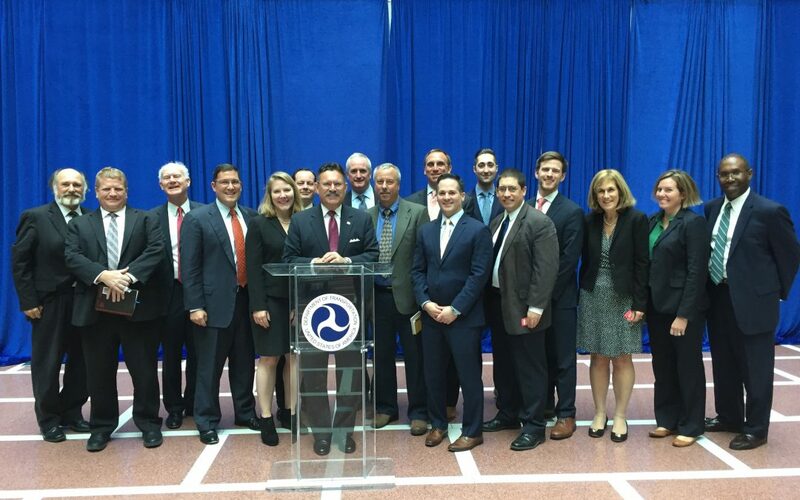 ARTBA Vice President of Regulatory and Legal Issues Nick Goldstein and other industry trade association allies Oct. 31 urged Federal Motor Carrier Safety Administration (FMCSA) Administrator Raymond P. Martinez to ease federal hours of service (HOS) regulations. The association representatives want Martinez to allow the transportation construction industry to have an exemption from the HOS regulations, which restrict the time long-haul truckers spend behind the wheel. Goldstein noted that HOS rules can result in work zones being kept open longer than necessary, which creates more opportunities for accidents involving both motorists and construction workers. The industry groups were following up in person on written comments sent to the agency earlier in October. ARTBA will continue to keep a dialogue open with FMCSA as the agency proceeds with their review of HOS regulations.